While it languished in distribution lingo, The Imaginarium of Dr. Parnassus remained the ultimate mystery, a movie featuring plenty of stars and even Heath Ledger's last performance, but one about which we knew nothing other than that it would be very, very weird. Now that Sony Pictures Classics has picked up the film, they've made available a slew of images from the film, including our first looks at Colin Farrell, Jude Law and Johnny Depp as part of this strange world. No, I still have no idea what's going on, or how they'll fill in for Ledger. But the images are both visually lovely and somewhat deranged, which makes them a real treat to see. Click on any of the four below to be sent to our entire gallery, featuring 26 images from the film and behind-the-scenes with Terry Gilliam. 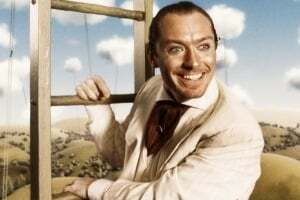 I'm partial to the one where Jude Law looks like a crazy man hanging from a hot air balloon. How about you?